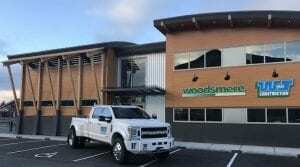 The Woodsmere Corporate Head Office also includes the Corporate headquarters for W&J Construction Ltd. our construction company. This modern architecturally designed 6,000 sq.ft. Corporate Head Office space has been constructed under the “Built Green” guidelines with energy efficiency a priority. We have included such items as an accessibility lift (Elevator), 2 electric car charging stations, bicycle parking, employee shower and lockers as well as incorporated state of the art technology throughout the building.